In past travels I have been all around Youngstown OH, but never in it. Sue and I took a four night mini-vacation in June to northeastern Ohio. It wasn’t expressly a railfan trip (it can’t be one if you take your wife along). Railroad wise the Youngstown area is not even a shell of what it once was. Before “Black Monday” in 1977 there were around 11 integrated steel mills in the Youngstown-Warren area. It was the second largest steel producing district in the country. 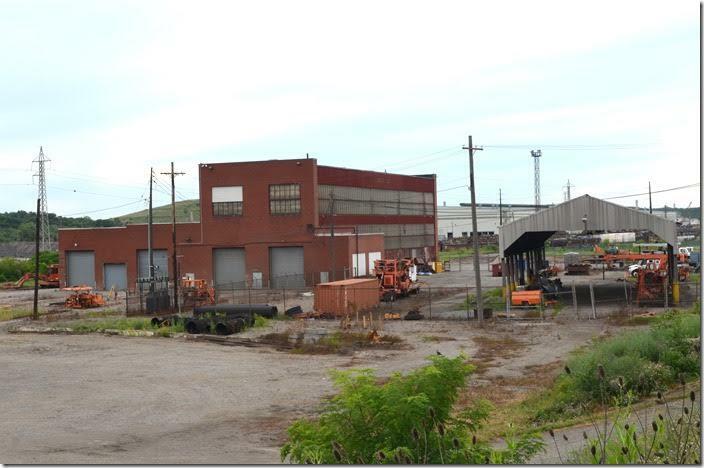 Youngstown Sheet & Tube closed first; Republic, U.S. Steel and others soon followed. Now there are no integrated mills with blast furnaces, etc. Youngstown was on the main lines of the Erie and the B&O, the end of the main line of the Pittsburgh & Lake Erie which joined a heavy duty branch of owner NYC and the Erie & Ashtabula Branch of the Pennsy passed through. All of these congealed at a malfunction junction called Center Street. In the day Center Street crossing was a scene of continuous action. Supposedly it was the busiest non-interlocked junction in the country if not the world. All trains came to a stop until the B&O train director instructed the switch handlers to align the trains through. Even the Capitol Limited came to a stop. 1. 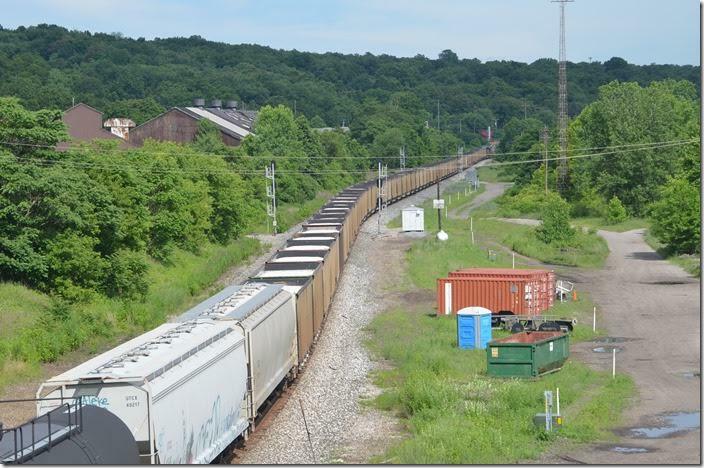 First we scouted the CSX New Castle SD coming west. We heard little on the scanner except this weed spray truck. The dispatcher seemed anxious to get him west to some point where he could run some trains. Other that occasional pairs of block signals, there is nothing of interest between New Castle crossovers and “Haselton”, seen here. That’s 15.7 miles with no crossovers....there are more places on Big Sandy to stash trains than that! P&LE’s Gateway Yard was east around the curve. That forest on the right was once Republic Steel. CSX weed sprayer. Haselton OH. 2. 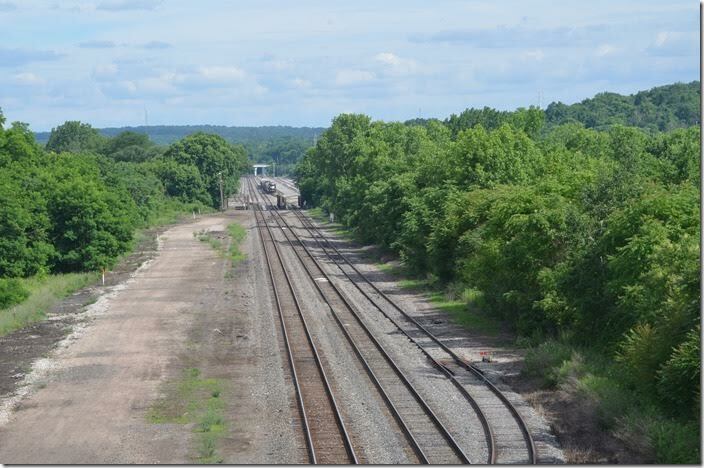 In the day there were 11 tracks in this view from the Center Street bridge between Campbell and Struthers. That’s downtown Youngstown in the distance looking west in late afternoon. NS owns the former PRR E&A main line. The single track is a former NYC connector to the P&LE, but I’m not sure of its function now except to connect with Genesee & Wyoming’s subsidiary lines in the area. 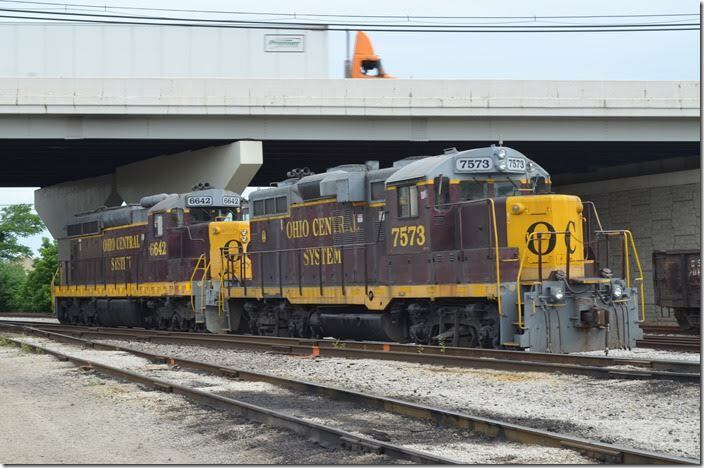 The B&OHS covered that lines Youngstown operations very well in the Fourth Quarter 2015 issue of The Sentinel. 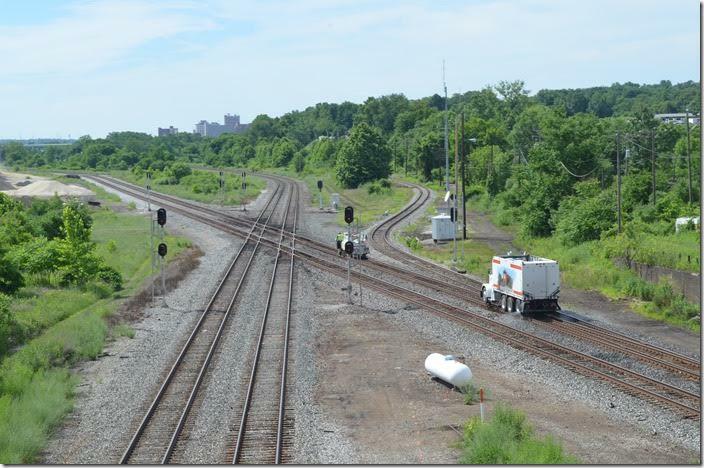 CSX weed sprayer. Haselton OH. View 2. 3. The Center Street bridge has been rebuilt. Yes there is wire, but railfans have cut holes in good places for photos! There are sidewalks on both sides, but the traffic can be heavy. There are places to park off the bridge on the Campbell (north) end. CSX Q348 rolls east behind 5238-752-8456-49. 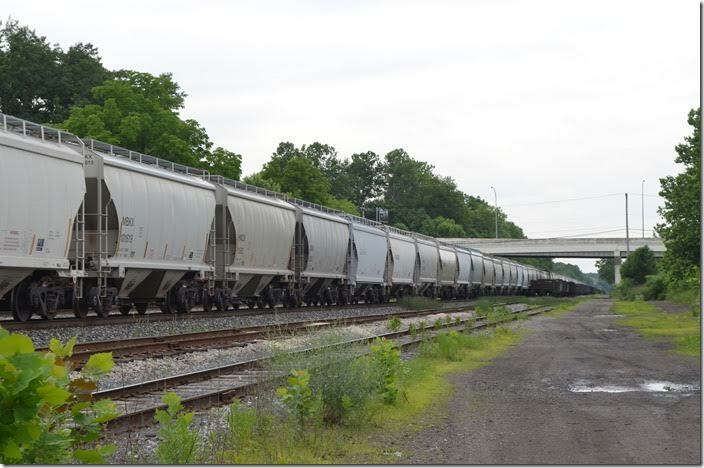 This appeared to be a loaded sand train in PMRX hoppers combined with the manifest. It was 190 cars!! 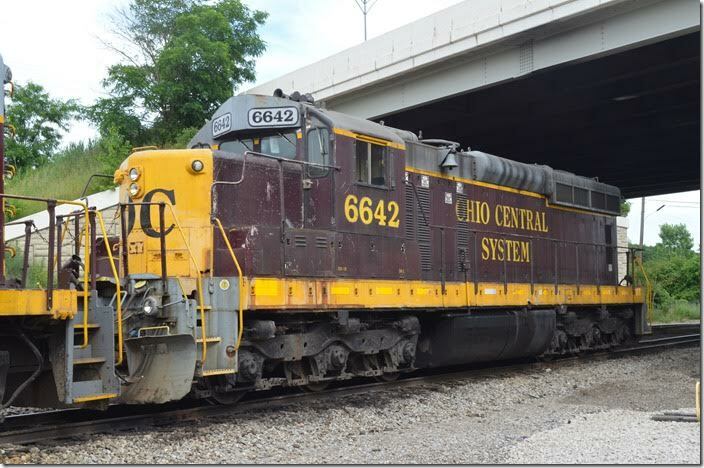 The dispatcher informed Q348 that they didn’t have to pick up at Ohio Junction, the local yard. I was relieved at that news. Republic Steel’s mill was at the left edge of this photo. CSX 5238-752-8456-49. Haselton OH. 4. PMRX 95515. Haselton OH. 5. CSX 5238. Haselton OH. 6. Q348 is almost clear of “Haselton” interlocking (Center Street). CSX 5238. Haselton OH. View 2. 7. 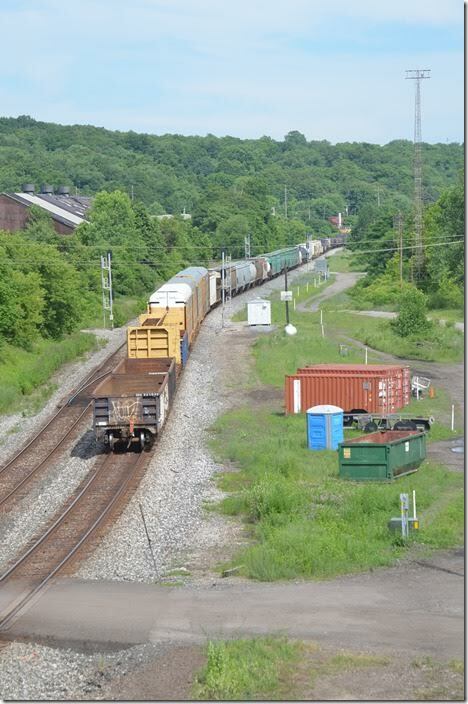 Looking east from the bridge at NS’s (ex-CR, exx-PC nee-PRR) Haselton Yard. Steel mill facilities were on both sides in this area. The bridge crosses the Mahoning River which is not more than a creek. Bridging it posed no problems for the railroads. Indeed the Mahoning River helped the railroads. It was not navigable therefore the mills could not receive raw materials by barge. 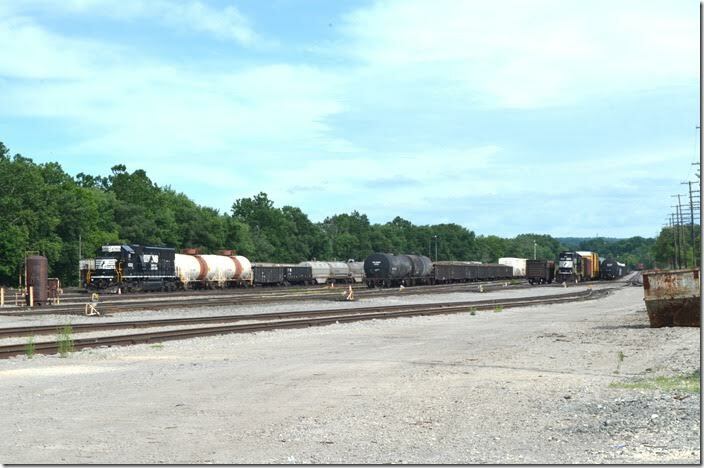 NS Haselton Yard. Struthers OH. 8. 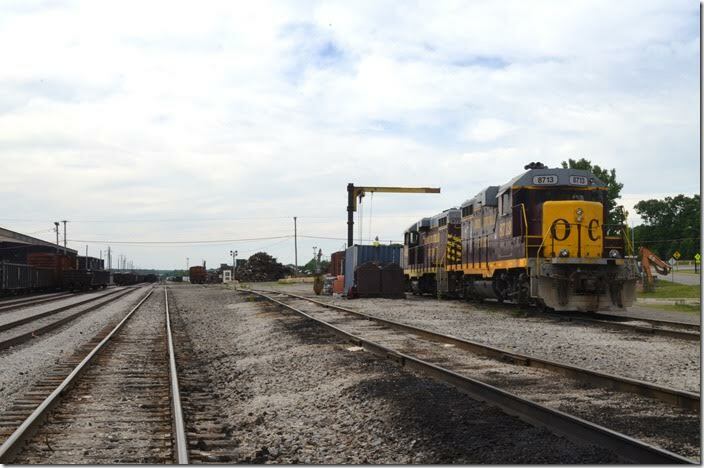 SD40-2 3458 at Haselton Yard. It was around 5:30 PM and no one was around. Unusual on a railroad. NS 3458. Haselton OH. 9. 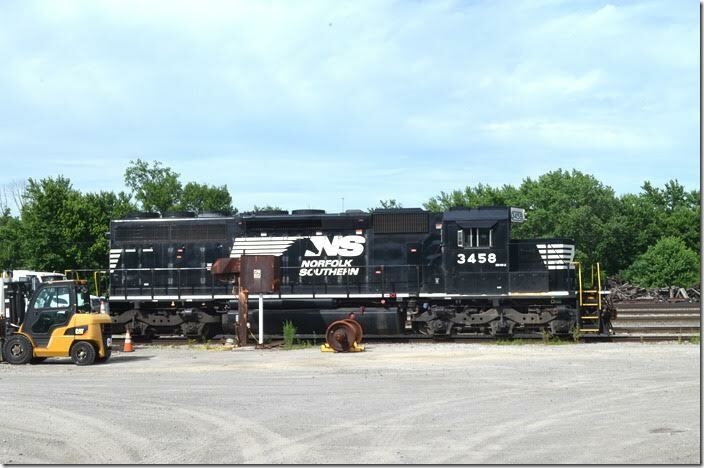 NS 6532 is parked out in the yard. Haselton OH. 10. NS 5348-3412-3458 were parked and shut down. Haselton OH. 11. We drove around downtown (very pretty) and then headed west. Ohio Central is now a subsidiary of Genesee & Wyoming. 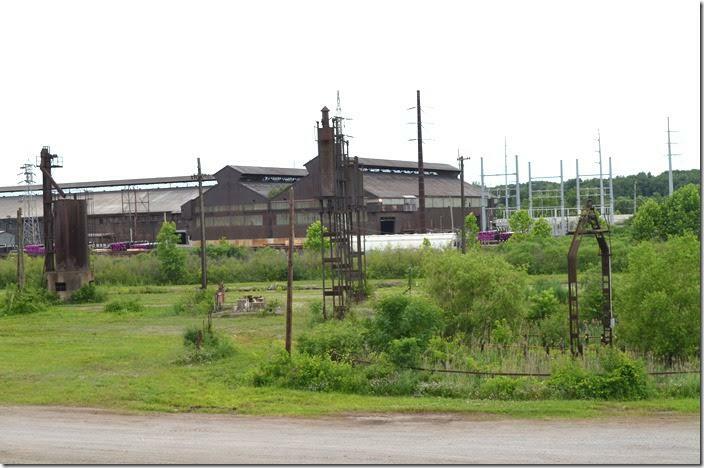 They have four subsidiaries in the Youngstown-Warren area; this is the Youngstown Belt Railroad. These are both ex-ICG “GP11” rebuilds. OC 8712-8713. Brier Hill OH. 12. 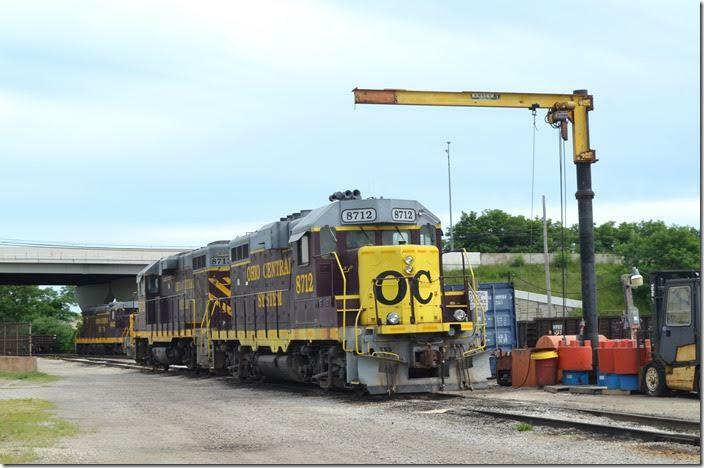 OC 7573 is an ex-Conrail “GP10”. OC 7573-6642. Brier Hill OH. 13. 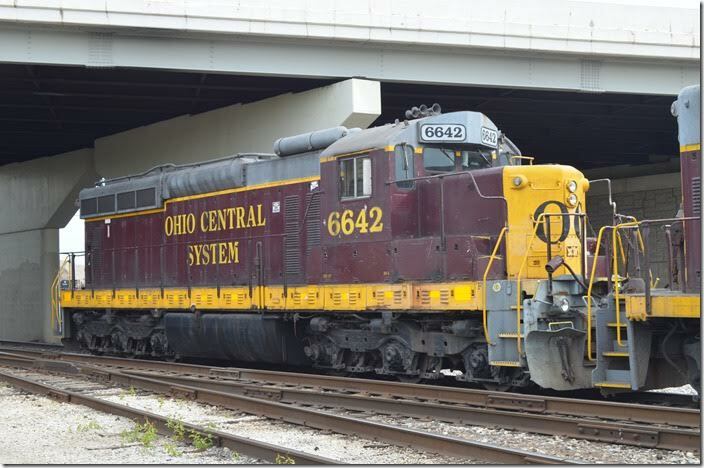 OC 6642 is lettered as a SD18. In reality it is ex-C&NW, nee-Southern Ry. C&NW chopped the nose, but I’m not sure if they down-rated it to 1800 HP. SD24s were turbocharged and 18s weren’t. I was shocked, but thrilled to find this rare engine. Brier Hill OH. 14. OC 6642. Brier Hill OH. View 2. 15. Looking west. Vallourec Star has a large tube mill on the left. I’m not sure whose railroad this used to be...perhaps the Erie. We are in the community of Brier Hill OH. OC 8713-8712. 16. We drove under the OC and south a short distance by the Vallourec mill before turning left on Ohio Works Road (USS Ohio Works when it was there). 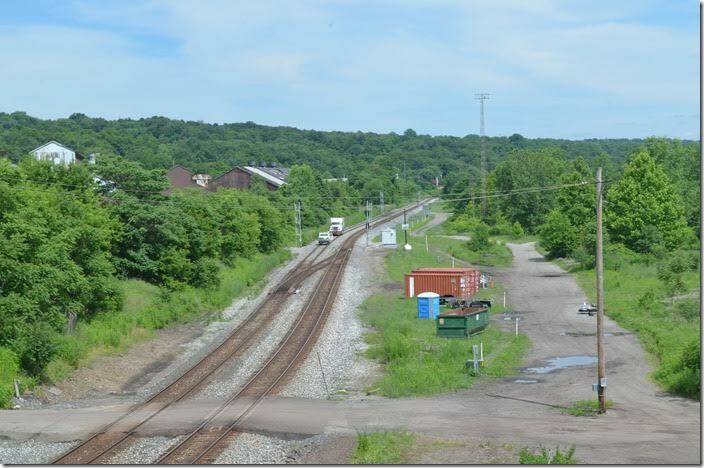 This is CSX’s Ohio Junction yard and interchange with the Youngstown & Austentown Railroad, another G&W subsidiary. 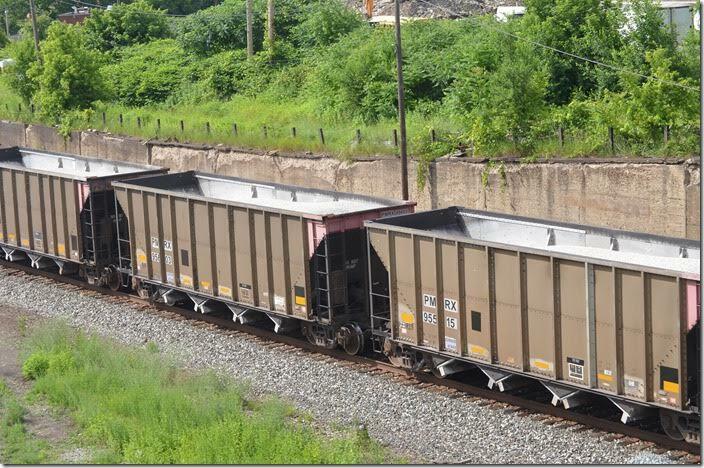 An eastbound intermodal had just ripped through passing this westbound unit train which I suspect is sand. The control point signal barely visible in the distance is “Yanda” (3.9 mi. west of “Haselton”). 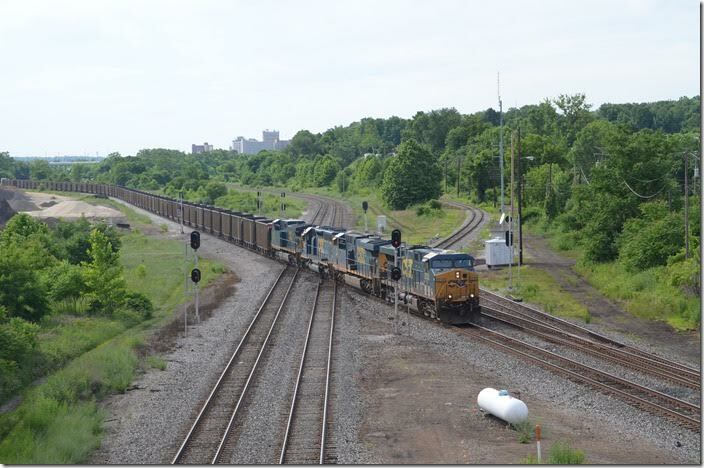 CSX wb Ohio Jc.t OH. 17. 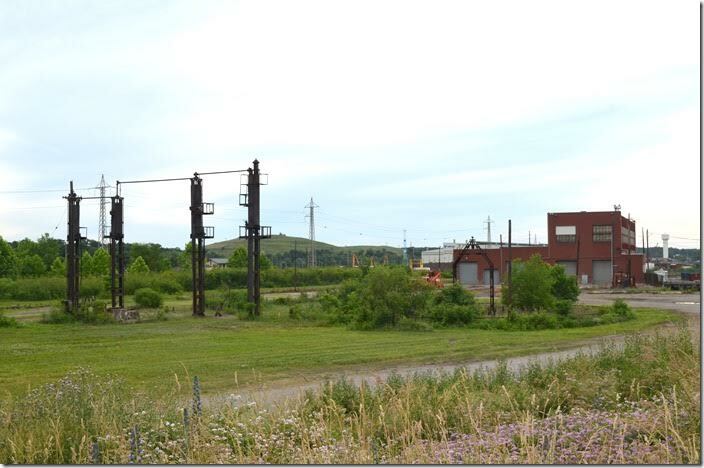 This is Brier Hill, the center of Erie-Lackawanna’s operations in the Mahoning Valley. E-L served YS&T’s Brier Hill Works. NS MW shop. Brier Hill OH. 18. That is Vallourec Star’s tube mill in the background. E-L’s turntable in the foreground. NS MW shop. Brier Hill OH. View 2. 19. 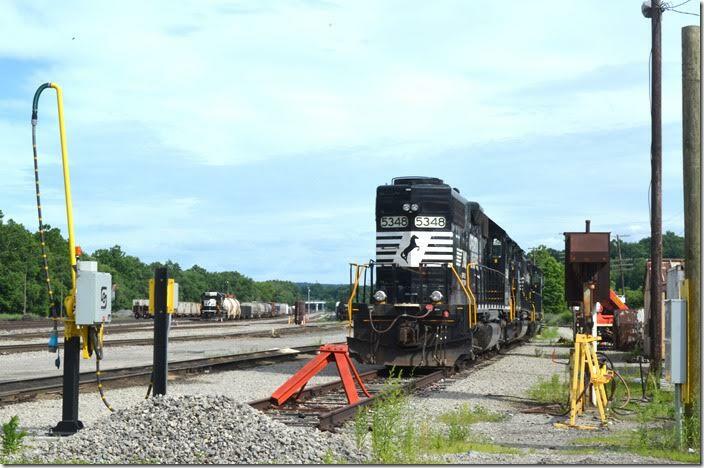 The old diesel shop appears to be a Norfolk Southern MofW facility now. I could still make out “Erie” along the brick above the top row of windows along the length of the side. NS MW shop. Brier Hill OH. View 3. For a good look at Youngstown before its demise, see Trackside around Youngstown, 1962-1982 with Dave McKay by Steve Timko, published by Morning Sun Books.